Good morning from icy Hamburg and welcome to our Daily FX Report. Today, the middle of the week is reached and we`ll report about the CAD and its situation. Furthermore we have interesting data from the U.S. and the euro zone. The CAD drooped to a four months low against the USD and reached 1.0527. The CAD lost 2.4%, its biggest intraday decline since June 2008 after the nation`s central bank intensified its warning that the CAD is growing too strong, that boosted speculation that the central bank will not raise the interest rates in the next time. 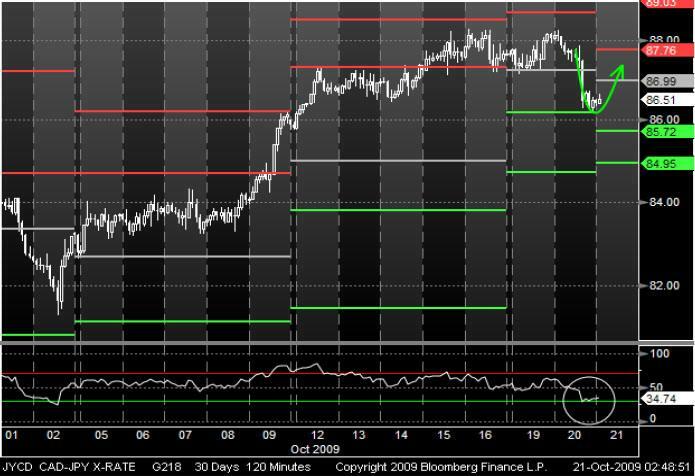 The EUR/JPY weakened after European policy makers warn that the strong EUR will derail the economic recovery. Furthermore the USD climbed against the JPY and reached 90.91. The U.S. stocks fell after the U.S. commerce Department showed that housing starts rising 0.5% to an annual rate of 590,000 in September from 587,000 in August. The economists forecasted that the housing starts to grow up to a rate of 610,000. In the euro zone are the finance officials very happy about a falling EUR. French President Nicolas Sarkozy called the 14 month high a disaster for the European economy. Also European central Bank President Jean Claude Trichet said that excessive volatility in currency rates is bad for a recovering. Since the beginning of October, the CAD has been trading in a bullish trend against the JPY. Recently, the currency pair traded in an upward movement and touched its Pivot point. For the moment, the support was strong enough and it seems that the CAD is ready for a pull back. Furthermore the RSI indicator could support an increasing trend and a successful pull back. 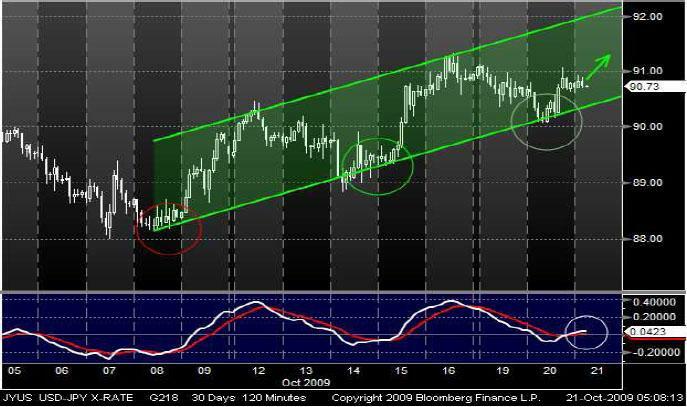 Since the middle of October, the USD has been trading in a bullish trend channel versus the JPY. Yesterday, the currency pair reached the bottom line from the trend channel and the prices could recover as like two times before. Always when it touched the bottom line, the prices rose to the upper line from the trend channel. Also a crossing MACD through the signal line from below may indicate a continuing bullish trend.